HJ: Intuition is like a muscle — it gets stronger the more you use it. And it also requires trust in oneself and the larger principles that govern intuition. The fact is that we are constantly receiving intuitional messages but most of us are so used to not listening to them and instead relying on our logical minds that they go unnoticed (in a sense). Those just getting started or learning to live solely from their intuition must begin an ‘experiment’ of sorts. You must suspend doubt and disbelief for a time and begin to follow the voice of the heart no matter where it leads you — trusting all will work out beautifully — and then experience for yourself firsthand the flow of intuition and how beautifully it always works out. Then your first hand experience will create the trust you need to turn your life over to it. And that, my friends, is when things get magical. Everyone has it no matter what you call it, gut feeling, hunches, eureka moments, knowing, seeing or hearing. Your intuition is a shortcut to productivity, insight, knowledge, innovation, and decisionmaking. 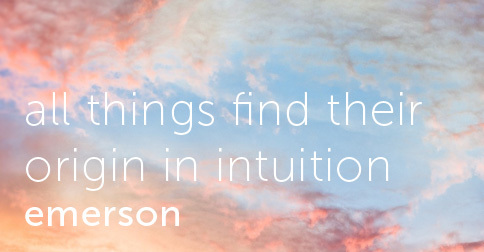 So how do you harness your intuition? How do you become more user-friendly with your intuition? Sometimes we think intuition is an event – like a flash of light. If we take this concept as how it happens, you are left to wonder. If you can think of your intuition as your partner, then the two of you can work together into a really rich partnership. I’ve used both and I much prefer the latter. If you concept it as a partnership then it becomes like a real gift and tool to be honed. You’ll have your own interpretation or meaning for what your intuition gives you. Why not start a collection of symbols you get and the meaning they are to you. For example: when I feel butterflies that for me means release, evolution, awakening, and light touch. Have you ever looked at a problem and known the root cause and the solution – instantly – without research? You’ve been taught to distrust that inner voice, right? So you reflect back on all the times you knew and did something different. In hindsight (the I told you so of intuition) your intuition was right on, wasn’t it? You have the ability to solve problems instantly if you trust yourself. We all do. So how do you harness the power of your inner guidance system – the voice that cuts through all the blah, blah, blah and tells you the truth of your direction and development? Why not use these 6 ways to buff up that guidance system? 1. Use your natural empathy – Imagine yourself in someone else’s shoes. Better yet go experience what they’re experiencing. If you are working a helpdesk and someone calls from the factory floor complaining about the speed of the printer, don’t sit at your monitor looking at graphs and metrics. Get off your monitor and imagine being down on floor with them, looking through their eyes and see what’s going on. Get your whole self involved and it will strengthen your intuition. Great battlefield generals know this. Get out of your bunker and ride up to the front line and see it, feel it, and act on it. Experience what others are experiencing. Just remember to come back to your own body and bring nothing back with you except your intuition message. 2. Allow yourself to name fear – When you are an empathy, you feel the fear and pain of another. Fear blocks intuition and is strengthened when we try to resist it. When you open to your intuition, it’s important that you not make anything you feel personal. It’s not about you. For one day, make a personal rule that nothing you feel is yours. Nothing. Allow yourself to say, I’m noticing fear. What is the fear? Hmm, I’m noticing fear of making a lot of money through business success and losing it all. Hmmm, whose is this? You see, if you are a natural empathy, you will know that the fear or pain you feel isn’t yours if a half an hour earlier you felt fine and were happily going about your business. Name what you feel and it strengthens your intuition. When you name it, the energy information will leave your body because you picked up the message. The messenger doesn’t need to keep delivering the message. 3. Connect with others – When you engage with another person, face to face, on the phone, or online, try to read their emotions. Name their emotions to yourself. Does the person sound angry, happy, hopeful, joyous, depressed, or sad? The more you connect with others emotions, the deeper your understanding of social situations and the better your intuition will function. Intuitive hunches and abstract ideas come from the same place inside you that form your emotions, so the better you are able to read and identify emotions in others the better you will be able to create and communicate via intuition. Identifying and naming emotions within yourself and others is a powerful exercise. When you name you become the witness, not the empathy that feels to the point of debilitation. Employ just enough empathy that you get the read. Name them to yourself. I’m noticing sad. I’m noticing anxiety. I sense butterflies. I get the feeling of plowing a field for planting. Connect and notice and name. 4. Shut down internal subjective judgments – When you find yourself judging someone or something – including yourself – that isn’t intuition, its negative energy that blocks your intuition. When you hear the critic in your mind saying, “he’s stupid”, “she’s ugly”, “I’m fat”, or “I’m gonna lose.” Stop and think – Is this me or am I picking up their self-judgment and internal identity state? You can ask, Hmmm, what am I picking up here? What does this mean for this person? Is this mine or am I picking up their state? When you strengthen your intuition, don’t make it about you – make it about what you are becoming aware of. You can check it out – ask, I’m picking up some internal self-judgments. Does that make any sense to you? They will tell you or dismiss it, but pay attention to the energy you feel from their response. Your intuition is not for you to sit in judgment of them, only to recognize what you pick up. 5. Make time for Solitude – The best way is meditation. Find at least thirty minutes a day to spend alone with your thoughts. Take time to sit alone with your thoughts, feelings, and visualizations. I’ve spent most of my life nearly unaware of all the stuff going on inside me. By taking the time to listen to your inner world, you’ll find out what an amazing magical being you really are. Learning to listen to yourself in solitude will train you to listen to your inner intuitive voice when you aren’t alone and will lead to catching powerful intuitive ideas right when you need them. 6. Ask questions – lots of them – Get buff with your intuition. Two thoughts here: 1. Questioning is the best way to create stronger intuitions. The most powerful creative intuitions will come to you after long question and answer sessions. Get together with a group of curious people and discuss complex issues – philosophical, scientific, sociological, medical, or literary topics. The most power comes not from the answers but from the questions, bringing you down paths you hadn’t considered, spurring further questions and more answers. There is no better way to exercise your intuition than lively question and answer sessions. 2. Asking questions includes checking in to gain verification that you did indeed pick up that thought, feeling or impression and it’s not just your imagination. Is any part of this true for you? I’m feeling ……. I’m wondering if that means anything to you? Does this make sense to you? Questions make it so you don’t feel alone in strengthening your intuition.